We’ve raised chickens for years, both for eggs and meat. Getting eggs from chickens is easy. Getting meat … well, not so much. No matter how many times you hear about various breeds being touted as “dual purpose” — good for eggs and meat — the meat part is likely to be disappointing. The bird that goes in your freezer is likely to be about the size of a skinny “rubber chicken” rather than the fat roasters you see on the rotisserie at Costco. So, like most rural Americans, we turned to Cornish Crosses for our meat birds. We’ve tried them on and off over the years, but we stopped raising them for two reasons. 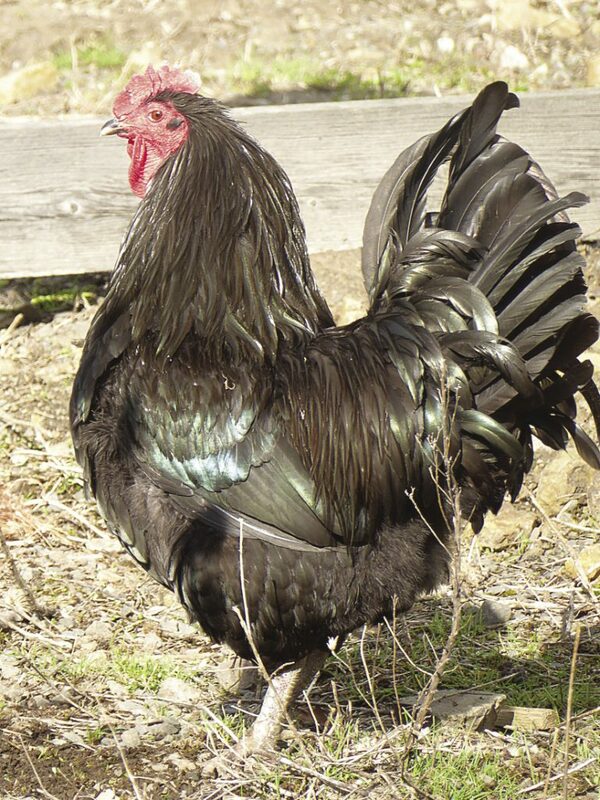 Our mature Jersey Giant roosters weigh a whopping 12 pounds each. Reason one: Cornish Crosses, as meat birds, fulfill their function superbly. They gain weight with a speed and seriousness that is awesome to behold. Within nine or ten weeks max, they’re ready for the freezer. Except here’s the thing: If you don’t put them in the freezer by nine or ten weeks, their bodies start to break down. Their organs fail. Their joints give out. They can’t walk. They expire at the drop of a hat. It’s horrifically sad. I call them weird freaky mutant chickens. Reason two: We can’t breed Cornish Crosses ourselves. We’re trying to make our homestead more self-sustaining, not less. If we have to purchase chicks from the feed store every time we want to raise meat birds, we’re taking a step backward, not forward. We looked into what it takes to breed Cornish Crosses, but it turns out they have a rather complicated tangle of genetics that precludes the home breeder from duplicating the exact lineage without a lot of dedicated work. Never have I raised a breed of chicken so willing to sit on eggs. 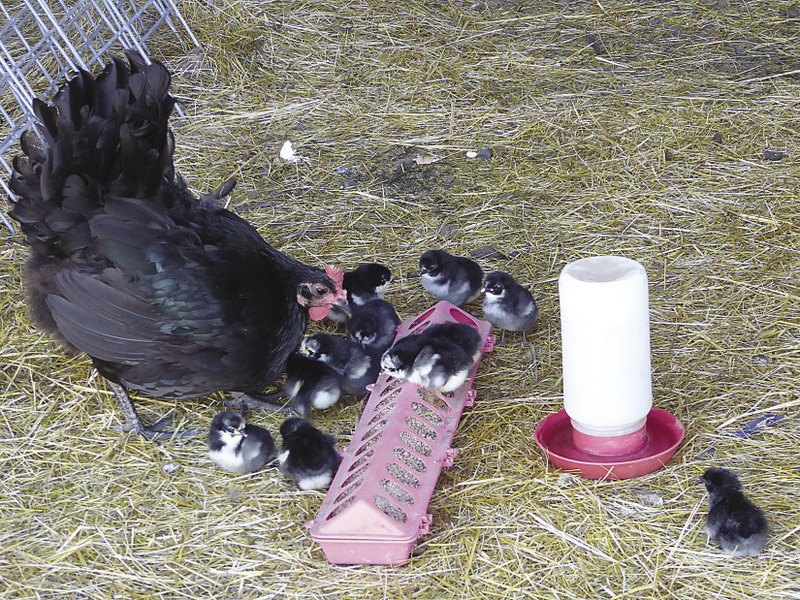 Reproduction cannot be overlooked as an important component of sustainability on a homestead. A couple of years ago, after butchering our last batch of Cornish Crosses, we decided “no more.” Never again did we want weird freaky mutant chickens on our farm. So the search was on for replacement birds. What breed would dress out large enough for a meal, yet stay healthy enough to grow to adulthood? What breed could equal the fat and delicious Cornish Crosses as a meat bird, but which we could raise ourselves? That’s when we found Jersey Giants. As the name implies, this breed was originally developed in New Jersey in the late 1800s by two brothers, John and Thomas Black. They were the original “commercial” meat chicken bred to replace the turkey, which was the primary table bird at the time (doubtless because other chicken breeds were too scrawny to provide a substantial meal, which we’ve found is true even now). They are considered the largest purebred chicken breed. Jersey Giants come in three colors: Black, white, and “blue” (a bluish slate-gray). Black is the dominant gene, so white birds come from breeding two recessive whites. Blue giants come from an incomplete dominant gene. There is also a “splash” variety, in which the bird has two copies of the blue gene. Splash birds are a paler slate color, or have whitish streaks. They are not recognized as an “official” variety and therefore can’t be used as show birds. On average, the blacks tend to outweigh the whites by about a pound. Today, the slower-growing Jersey Giant has been entirely supplanted by the fast-growing Cornish Cross in the meat industry, a fully understandable decision in terms of profitability. However for the self-sustaining homestead, where “fast” isn’t as strong a consideration as “humane” and “reproducible,” the Jersey Giant has proven to be a superb choice for us. Jersey Giant hens are fantastic layers of brown eggs, and will go broody all year. They are not much larger than other large breed hens at maturity. In June 2015, we received 10 pullets and five straight-run (unsexed) chicks from Murray McMurray Hatchery, all of which arrived in excellent health. Of the straight-run chicks, three were roosters (one of which got picked off by a coyote). We haven’t butchered our two roosters since they are our flock sires. We have several young second-generation roosters who have not yet reached butchering weight (as of this writing), however our current mature boys weigh in at about 12 pounds each. Using the average ratio of live weight to dressed weight (dressed chickens are about 75 percent of live weight), we can anticipate about a nine-pound bird in the freezer at butchering time. Since most chickens are processed at about 4.5 pounds live weight, we expect a satisfactorily hefty roaster. Jersey Giants have a reputation for growing “slower” than other breeds of chickens. In fact, they grow at the same pace; it’s just that they have farther to go to reach their full size. They tend to achieve their large frame first, then put on weight later. Since roosters take about nine months to achieve maximum weight, they are considered to have a poor feed/weight conversion. Again, that’s a factor for commercial enterprises, but not as important on a homestead. We’ve found the hens to be not much larger in size than Black Australorps or Rhode Island Reds, so our meat efforts have been concentrated on the roosters. We keep the two mature roosters with the hens for both fertilization and protection, and they are all free-range. Our young roosters destined for the freezer are kept in a separate pen with a large enclosed run. Allowing chickens to free range outside and in the barn compost helps to supplement their diet to a degree that our feed costs are lowered tremendously. We are also working on raising more corn and wheat to feed them, in addition to feeding our family. With the Jersey Giant emphasis on meat, we had no particular expectations the hens would be anything more than adequate egg layers. As it turns out, the hens are superb layers. Of course they don’t equal breeds which are dedicated for eggs, such as Leghorns, but we have been more than satisfied by the amount of henfruit we’ve received. The eggs are on the medium-to-large side, but not especially huge. The eggs are brown, varying from dark brown to light cream, and sometimes show faint speckles. Hens start laying small “pullet” eggs at about the same time as other breeds, at five months of age or so. I’ve claimed Jersey Giants as excellent triple-purpose birds. They’re excellent for both eggs and meat, so what’s the third benefit? Broodiness. I have never, and I mean never, seen a breed so inclined to go broody. As anyone who has ever raised chickens knows, broodiness has been bred out of many breeds. 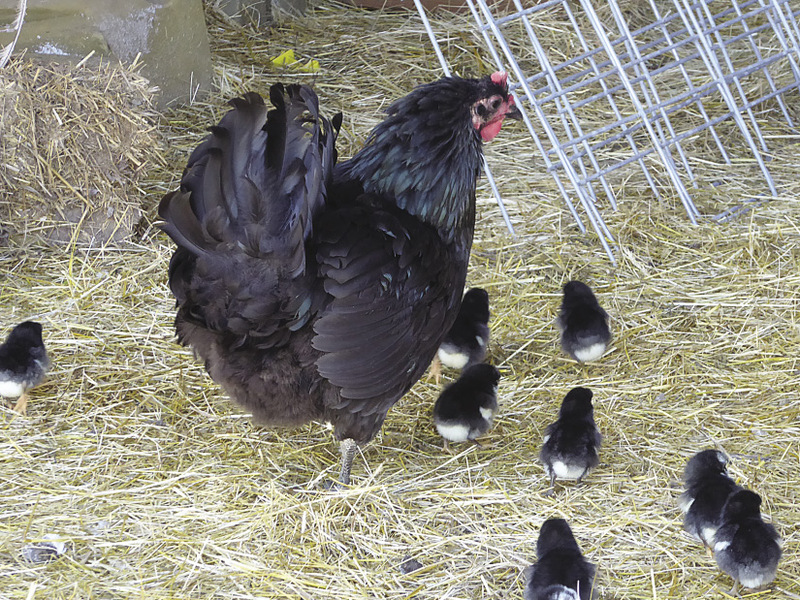 Several types of chickens are known to be more inclined toward broodiness (notably bantams), and sometimes a particular hen of any breed goes broody, but in our experience, only the Jersey Giants have been remarkably consistent in their instinct. During our first year with Jersey Giants, I had hens going broody at all times and in all places. I keep about a dozen wooden “nest eggs” to encourage hens to lay in convenient places, but I’ve also found these false eggs to be useful when hens go broody in the wrong season. One dedicated hen stayed on a batch of wooden eggs through bitterly cold December weather (I picked her up and put her in the coop each night, and each morning she would faithfully re-settle herself back on the fake eggs, located seven feet up on top some hay bales). Some people say Jersey Giants are so big the broody hens tend to break their own eggs. I haven’t had that issue, namely because our girls are not that large. Last summer we allowed two hens to hatch their broods. After the first lady hatched a “baker’s dozen” of chicks, a neighbor happened to stop by. When we showed him the babies peeping around their mother, he was delighted. “Aha!” he exclaimed. 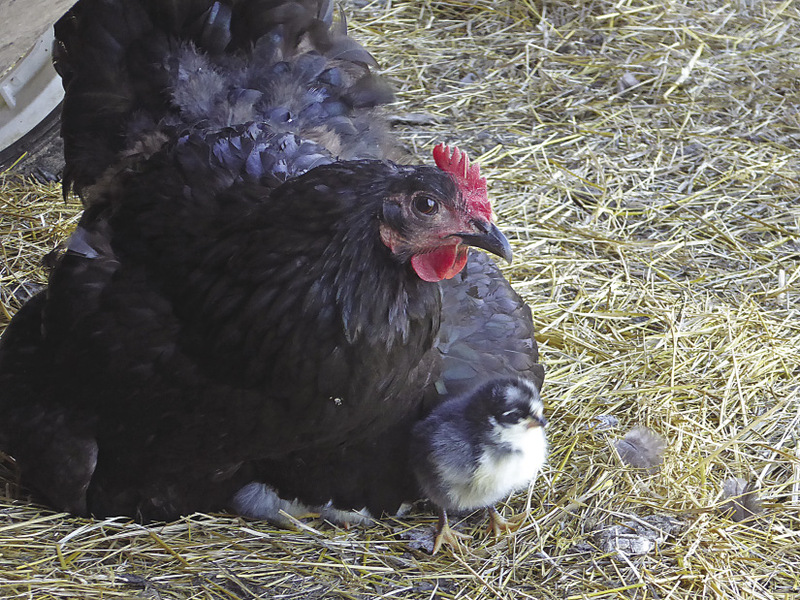 “Sustainability!” Broodiness has been bred out of so many chicken breeds that finding a hen who will hatch her own eggs is increasingly rare. Of course, nothing is perfect. There will always be something dissatisfying with any breed of chicken. • Slower maturity. We aren’t overly concerned about this. • Dark feathers, which can leave dark pinfeathers on a plucked bird during butchering. Raising white Jersey Giants will reduce this detriment. • Roosters, due to their large size, can be a bit tough on the hens. We had a few bald ladies with bare backs until the boys got into their stride. We have not found the roosters to be aggressive toward people. • They require proportionately more feed, which can be offset by allowing the chickens to be free range. Heritage breed chickens have several benefits: they reproduce and genetically maintain their qualities through natural mating; they have a long productive outdoor lifespan, and their slow growth rate means their skeletal structure, organs, and muscle mass develop healthily. At this point, we consider the benefits of Jersey Giants as outweighing the detriments. The ability to sustain a flock was high on our list. Add to it the large size and the egg-laying proclivities, and the result is an overall excellent choice for a homestead chicken.